While a list of places to eat is all I can really give you without trying every restaurant in town . . . I do have a personal recommendation - Palmeras. Located just south of the main pier, Palmeras is always packed . . . and for a good reason. Good food, good prices, and great service (somewhat of a rarity in many parts of Mexico). So if you are arriving by cruise ship or ferry, and you want a good place to eat . . . just head south from the dock and you will see it on the left. Costa Brava : Seafood . . . 57 Calle 7 between Melgar & 5 Sur. 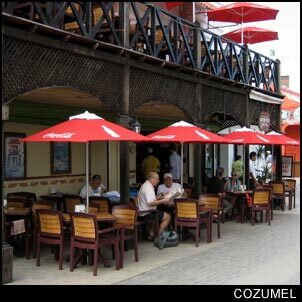 French Quarter : Cajun food on the south side of the plaza San Miguel (Av. 5) on the second floor. Garden of Eatin' : Mexican . . . On Salas between Melgar & 5 Sur. Las Tortugas : Seafood . . . Av. 30 & Calle 19 Sur. Pepe's Grill : Dinner only up-scale restaurant located on Melgar & Calle Adolfo Salas.